When it comes to examining the contribution of several different sectors to a country’s economy, there is one often overlooked field: the gambling industry. Casino games like blackjack and roulette are enjoyed equally across the world and popular card games like poker or baccarat are drawing in more fans every day. People love to place bets and wagers and they also love a good old-school online slots game – which also means spending money, whether on casino table games or on online casinos. All this vibrant activity is translated into financial terms, as gamblers by definition tend to invest significant amounts of money into their pastime, while a vast array of hospitality services have sprung up alongside land-based casinos, like entertainment venues, restaurants or large shopping malls in casino cities. Australia and New Zealand are among the countries with the most fervent gamblers. In Australia, traditional games of luck like lotteries, sports betting and “scratchies” are very popular among the general population. Online gambling has also seen a rise lately, with online casinos and slot games gathering in crowds thanks to the convenience they offer. The situation is very similar in neighbouring New Zealand, where the online casino industry is evolving at a staggering rate. Competition is always improving the race, as online casinos for Kiwis constantly introduce new games and elements of innovation to attract players. Online pokies are probably the most popular option among online gamblers, who prefer them among all casino games and value variety and fast payouts. Mobile casino apps have also boosted the industry’s marketability and it seems that clients seek the convenience of a mobile experience, which explains why the most popular online casinos in the country all have very thorough mobile sites. In the UK, casinos and the gambling industry in general also have a significant impact on the economy. From October 2016 to September 2017, the British gambling market generated a total £13.9 billion, while the remote sector alone contributed almost £5 billion. The online betting, casino and bingo industry corresponds to 35% of the market share in those sectors. In September 2017, more than 100,000 people were employed in the industry and by March 2018 the total number of betting shops had reached 8,532 and the total number of casinos amounted to 152. Sports betting and race betting remain very popular in Great Britain, as do more traditional gambling games like bingo – in September 2018 bingo premises in GB reached almost 650. Of course, horse race betting has a long history in the UK and horse racing is connected to some significant moments in national history and forms part of national culture – it is well known that the Queen herself is an avid fan of the sport. It is only natural that betting on horse races attracts so much attention in the British gambling industry. A lot of the funds are also redirected into good causes: from October 2016 to September 2017, the National Lottery gave back £1.5 billion to charity and a further £251 million was contributed by large society lotteries. 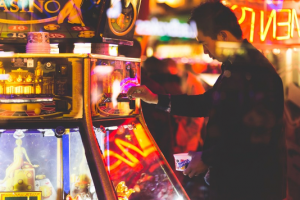 From lotteries and horse racing to modern online casinos and online slots, the gambling industry is constantly evolving – but its contribution to the economy remains significant across sectors.